A lovely thistle-like daisy from Southern Africa producing lots of pale purple/sometimes white flowers in midsummer to the first autumn frost. Flower spikes can be 60-100cm tall, rising from a rosette of prickly leaves and stems. This is a long lived perennial plant, generally classified as half hardy and grown as an annual in the UK, but can tolerate light frosts and well worth protecting over winter for flowering in later years - you will get bigger spikes of flowers in the second year. Shows best grown together in groups in a border or in rockeries. Looks nice grown with Eucomis autumnalis (Pineapple Lily). Plants grow best in sun and well drained soil. Sow in spring to autumn in a tray of seed compost. Cover lightly with compost, keep at room temperature (around 20°C) and seeds germinate in 2-3 weeks. Transplant seedlings to pots when big enough to handle and then out into the garden after the last frost. Protect autumn sowings in a greenhouse or coldframe in the winter before planting out in late spring. 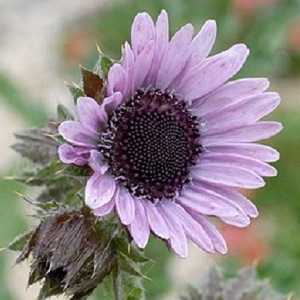 Plants grow a rosette of leaves in spring and send of up flower spikes with lovely big daisies from midsummer. Plants die down in autumn after flowering when the dead material can be removed. Mulch the plant well in autumn and it has a good chance of surviving winter if planted in well drained soil. Mature plants form a clump of roots which can be divided every 2-3 yrs in spring or autumn to keep them flowering well.